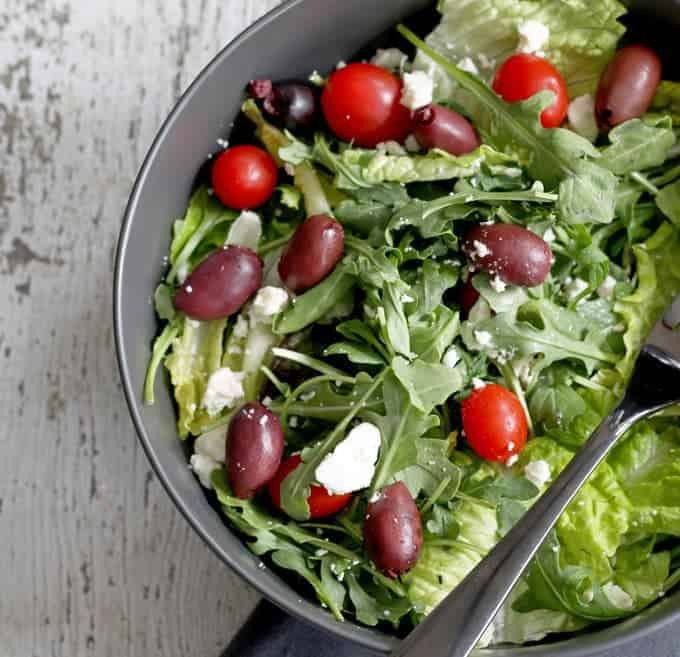 Celebrate life’s small moments with pizza and this no-recipe greek tossed salad. Whether it’s a stay-cation, a hockey game, or just because it’s a sunny day, a pizza is bound to bring back happy memories! Last year when I met Jacques Pepin, he spoke in length about food and memories. How you could eat something and be brought back in time to the last time you experienced that taste. I was going through a box of old photos and was surprised to see how many times I have celebrated life’s moments with pizza. No 18th birthday part is complete without pizza, right? Surprising a friend at work on her birthday? Pizza. 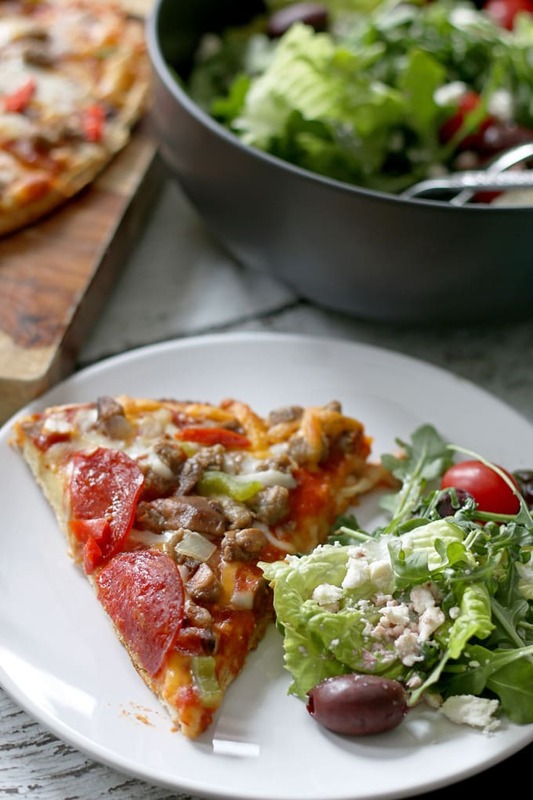 But we still break out the pizza, usually paired with salads now. 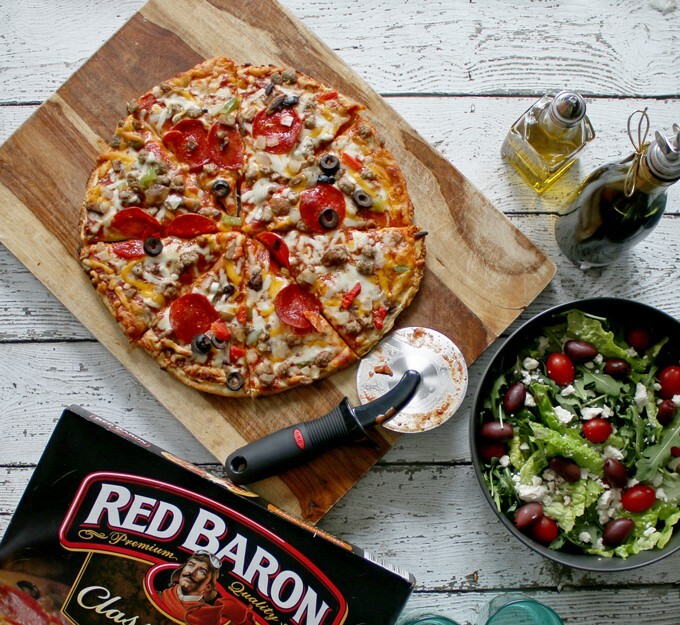 If you are looking to enjoy life’s small moments like we do, Red Baron pizzas are a great place to start. The crust bakes to a delicious golden brown, the sauce contains just the right medley of herbs and spices. And cheese! Oh the cheese! Visit the Red Baron to travel through time and enjoy the Timeless tradition of pizza nights, as showcased with traditions, fads and trends from the four decades that Red Baron has been around. Help Red Baron celebrate 40 years by enjoying a family pizza night! Let me tell you, best salad ever for pizza. I often can’t decide on a pizza flavor… so we make two! This recipe is a non-recipe in that you just throw all of the ingredients in a bowl and eat it. You literally put as much of each veggie as you want in the bowl and eat! Combine the lettuce, arugula, tomato and green onion in a bowl. Top with kalamata olives and feta cheese. Sprinkle olive oil and vinegar on the top. The Baron made his debut on the package in 1978. He’s been a recognizable part of the logo ever since. My best pizza memory was when we had a pizza party after going to the state skiing meet in high school! We love Red Baron pizza! It is our favorite pizza. When my son was 4 years old we had to move to a new town and house and everything was a mess. We had not unpacked and we only had a big cardboard box set out with a couple of chairs and I decided to make it a pizza night. We made Red Baron pizza and sat on our chairs and I put a tablecloth over the cardboard box and had a wonderful fun dinner in our new house. What a fun memory Julie!! Sitting around the kitchen table on a rainy night waiting for the delivery van with the hot spicey pie! A pizza memory I have was when I had pizza for the very first time. I was 17 years old in high school and on my first date. He took me out for pizza. I’ve loved pizza ever since! I think pizza is the perfect first date food!! My sister and I make pizza every Friday since my parents passed. Thank you! Favorite pizza memory: having pizza at sleepovers when I was a kid. I remember the first time I got to order Gluten-Free Pizza with the rest of my family when they went out to eat. Simple, but still made me happy. I remember eating pizza in Japan – it had corn and dried bonito fish flakes on it! My favorite pizza memories are of my sister, niece and I would rent movies every Friday night. Once we had chosen and rented our movies when would always stop by the local supermarket and purchase two frozen Red Baron Pepperoni and Cheese pizzas. We would watch movies and eat pizza the entire night! I remember my daughter’s birthday, pool, pizza party. I live alone from a year ago, and my father came to visit me!! I missed him a lot, we ate a delicious pizza, her favorite food. We usually have an Italian-style dinner on Sundays. We typically have pizza on Sundays. My favorite memory is every year on Christmas eve, eating pizza with my family and playing board games! We used to play poker at Paul’s Bar in Colroado Springs on Sunday nights and the pizza parlor on the corner would give us all their leftover pizza when they closed! I lived in Italy for a year and a half and I got pizza al taglio every day when I was on the run–best 18 months of my life. Lived in Italy for a year and a half and I got pizza al taglio every day when I was on the run–best 18 months of my life. When I was a kid someone left the pizza box open and our poodle was sitting in it finishing it off. When my grand daughters were young we’d have them over and make pizza, each her own kind. A pizza memory…I worked at a pizza place in my late teen years, best 3 years of my life, really! We had so much fun. Kind of different style pizz preparation apart from our hometown.. Thanks for sharing the great ideas???????????? My best pizza memory is when my husband surprised us (grandchildren and daughter) with a pizza party on Valentine’s Day a few years back. It was the best Valentine’s Day I have every had. Everyone had such a good time. We love cooking up pizza for game nights. My happy pizza memory was being with my family. We enjoyed eating pizza while fellowshipping!! And oh, also with my friends! Pizza is fun to eat together with someone you know and close to your heart!! ???? We even make fun of the pizza like putting it on someone’s face, because we’re already full!! ???????? I think one of my favorite pizza memories was when I was a teen I worked with my dad at a real estate office and for halloween the boss got pizzas my dad would never get at home. I discovered so many different toppings because dad was pepperoni only and would never let me get what we wanted. Best Pizza memory: Eating a hot steaming slice of pizza walking down the streets on NYC, as a kid. i only eat pizza. anything else is inferior. LOVE easy salads like that – as a kid we had homemade pizza Fridays and a big salad and always had so much fun. My favourite pizza memory is when I cooked a large pizza for the first time at home with my mom! It turned out delicious and I remember everyone in my family loved it and it was gone in minutes! Yum! This is my favorite kind of salad with vinegar and oil just like my mom makes! Thanks for sharing! After my nieces wedding, we were so hungry, so at 2 am we ordered Pizza, and at it while in our fancy gowns! That was a great night with a lot of Pizza! Red Barron was a staple in my house when I was growing up. My mom was a working single mom, so every Friday she’d pop these in the oven and we’d enjoy our “take out” night. When I got to college and eventually lived on my own, I carried that tradition with me, and like you paired it “grown up” things like salad or (when we could afford it during our college years) beer, then wine (when we got a bit older). So, this post is nostalgic for me. 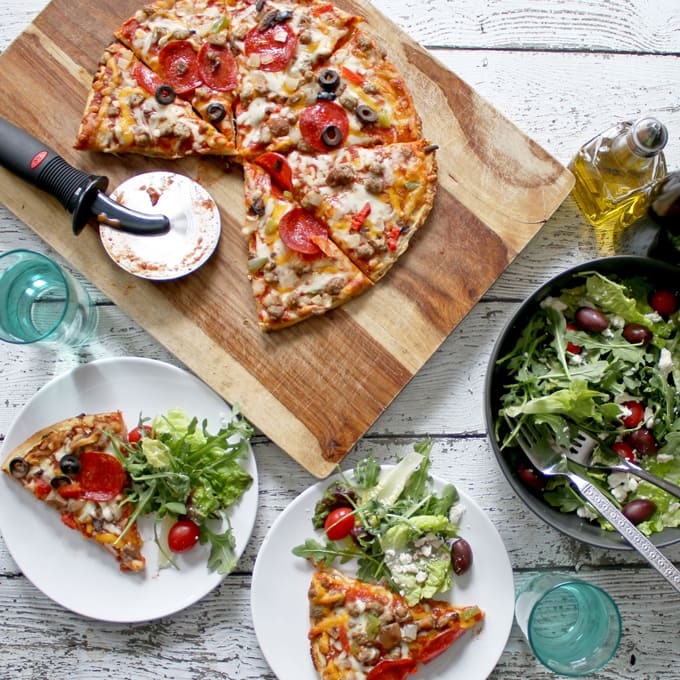 I love the salad you share, but also the milestones that pizza is a part of. Thanks so much for sharing this with us on #SHINEbloghop this week. We’re so glad you could join us, Jenny! pizza is always a fav around here! My best memory was having pizza with root beer when I was a kid. 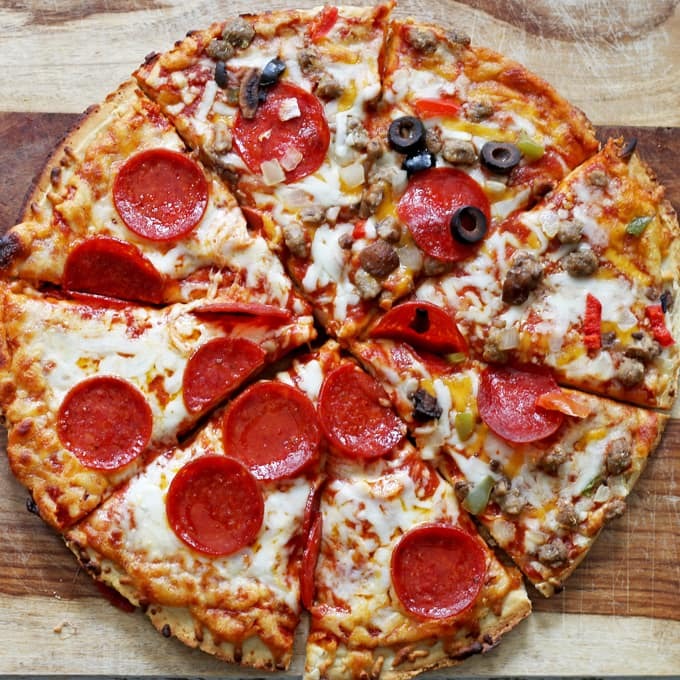 When I was a younger teenager we didn’t really have any pizza in our town – but for slumber parties we’d get a box of pizza mix and make our own! Now most kids probably can’t imagine not having a pizza place! Thanks for sharing on our Throwback Thursday link party last week and I can’t wait to see what you have for us this Thursday! after the pizza guy delivered the pizza, we discovered one slice missing–guess he couldn’t resist!